A tiny pizza joint serving up New York-style pies. 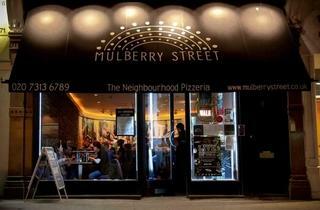 Mulberry Street confidently bills itself as a New York pizzeria: a bold move. But this native New Yorker thinks that these oven-hot pies are the closest thing to the Big Apple that you can find in London. And that’s saying a lot. A few words of advice: order the 20-inch pie to get that good base that’s both chewy and crispy at the crust. The 10-inch pies aren’t going to disappoint anyone, but the 20-inch is a real crowd-pleaser (even if it’s a just for a crowd of two. No judgment). In terms of toppings, stick with something unfussy like the spicy pepperoni. Some of the pizzas just have too many garnishes, which weighs down the pies into a saggy, soggy mess. 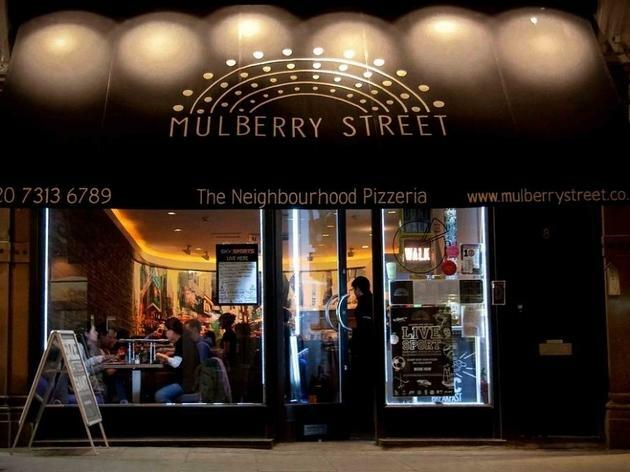 Mulberry Street knowingly provides shakers of dried oregano, garlic powder and chilli flakes – New York pizzeria staples – so take advantage and use them liberally. Make it rain. On a weekend night, expect all five tables of this frill-free, neon-lit pizzeria to be filled and a stream of orders getting ushered out for delivery. (In other words, don’t expect much in terms of service.) Also, the starters (salads and dippers) and desserts (chocolate cake and tiramisu) are uninspiring, which is all for the best really. Skip them, and leave more room for pizza. I ordered a large 20" Meat pizza over the phone for delivery. It arrived within 12 minutes which I thought was quite impressive. When I opened the pizza box I got an immediate unpleasant whiff. The pizza smelled as if the ingredients had expired. The base was wet and soggy. As I tried to lift up the first slice all the topping fell off the pizza and I was left just holding the pizza base. This was the worst Pizza I'd ever seen and I didn't eat any. The next day I went to the restaurant and I brought the pizza with me. I was told by the front of house staff to throw the pizza away and that they don't need it back. I was told to leave my details and that as the manager doesn't work in the shop I should expect a call back. 2 days passed and still no call from the manager. When I finally got hold of the manager (that doesn't work in the the restaurant in which she's the manager of), she was so rude and said she'd not be giving me a refund as I left the shop with the pizza so I could have eaten it. Apparently I should have left it in the shop. I tried to explain that I was told by a member of her staff to throw the pizza away but she wasn't listening. She continued to speak over me and then hung up on me! If you're into terrible customer service and even worse pizza then this place is for you. If not, I recommend Pizza Hut less than a minute up the road. They may have got my £29 for ONE pizza this time but I'd rather go hungry than eat anything from this place again. The pizza is very bad. Tastes like nothing and is very soggy. I would not recommend this place because the price is too much for what they offer. Stay away from this disgusting place! I've been here many times now for an NY sized pizza with the family, and for us it's one of the best pizza places in Notting Hill, and there are quite a few! Definitely recommended is the delicious Porcini Mushroom pizza. Service and staff are great, they're very friendly.